Conservative blogger Rick Moore has asked me to appear on his Internet radio show, Holy Coast on the Air, this coming Monday night. The whole thing happens at 10:00pm Eastern, 7:00pm Pacific. If you go to the link, here, you'll be able to listen. There's also a number there for you to call in and participate. For a bit about Ohio and presidential politics, see here. Mike Smith, lead singer and keyboardist with the Dave Clark Five, has died. After the Beatles, the Dave Clark Five were my second-favorite British band, featuring compelling melodies with great hooks, unique instrumentation, great harmonies, driving rhythms, and R&B-tinged vocals from Mike Smith himself. The last years of Smith's life were dogged by suffering. Here, here, and here are three previous posts about Smith. I spent a long time as a student: thirteen years in public school, four years in college, four years in seminary. Somewhere around the end of my twentieth and the beginning of my twenty-first and final year as a student, I figured something out. Do you want to know what it was? It was this: If the teacher repeats something, it’s probably important. Now, I bring this up for a reason. Jesus’ words to us tonight come from the Sermon on the Mount in the Gospel of Matthew. Ed Markquart, a wonderful Lutheran pastor in Seattle, has calculated that in the four gospel books of the New Testament--Matthew, Mark, Luke, and John--”there are 60 teachings, 40 parables, and 25 miracles of Jesus.” And the Sermon on the Mount contains a whopping twenty-five of Jesus’ sixty teachings. They come at us at such a furious pace in chapters 5, 6, and 7 of Matthew’s book, that you think Jesus would hardly have the time to repeat Himself in order to highlight what’s important. But He does repeat Himself in the ten verses that make up our Bible lesson. In fact, Jesus punches home the same teaching three times in these verses. And then, to underscore His teaching, He asks seven rhetorical questions, all with the same message: DO NOT WORRY! Jesus also gives us plenty of good reasons for heeding that imperative. He says that life is more than food or clothing and that if God the Father takes care of the birds, He’ll take care of us. He says that worrying won’t add a single second to our earthly lives and that to be consumed with these things is to be as futile in our thinking as the Gentiles with no knowledge of God. So, why exactly do we worry? And what does this all have to do with the fourth petition of the Lord’s Prayer, “Give us this day our daily bread”? We worry, let’s face it, because we’re control freaks. Adam and Eve were lured into sin because the serpent told them that when they ate the fruit from the tree of the knowledge of good and evil, they would “be like God.” It bothers us that while, unlike all of God’s other creatures, we can project and to some extent, predict, what the future will bring, we can’t control what happens to us. This reality can play itself out in ways that are anywhere from annoying, such as when we get caught in a traffic jam on US 33, to life-threatening, as when the doctor tells us that we or a loved one has cancer. Yet we persist in stewing over things over which we have no control. It’s good for us to make plans and it’s good for us to be engaged in trying to solve problems. But we need to realize that worrying about things solves nothing. The number one fact of the universe is that God is God and we’re not. So, make your plans and when the time comes, willingly move on to Plan B.
Jesus puts it this way: “So do not worry about tomorrow, for tomorrow will bring worries of its own. Today’s trouble is enough for today.” Pastor Gerald Mann summarizes Jesus’ imperative this way: Wait to worry. So, worrying is a bad thing. But what’s it got to do with “Give us this day our daily bread”? Just this: No matter how facile you may be at multitasking, there are two things that are very difficult to do simultaneously. Though you may be able to do them both at the same time for awhile--maybe decades--eventually, one will win out over the other and become the prevailing habit of your life. You can’t keep worrying and be thankful to God at the same time. Worrying represents unbelief and the other faith in God. Each moment of our lives is a contest between worry and thankfulness, unbelief and faith. In the end, worrying is a form of self-worship. Even though we may express our worry by saying things like, “What am I going to do?,” seemingly confessing helplessness, the underlying assumption is that my immediate problems and, by extension, the long-term good of the known universe, depends on me. Thankfulness, on the other hand, takes an inventory of our lives and asks, “What has God already done?” How has God already blessed us, starting with our eternal salvation through the cross and resurrection of Jesus Christ? The remembrance of these blessings leads to thankfulness and that leads to something else. Thankfulness, you see, is a byproduct of faith. It gives us the capacity to face whatever life may bring to us. One of my enduring memories as a pastor is of my visit with an elderly farmer shortly after I was ordained twenty-four years ago. “You know, Pastor,” he said, “if you’re a farmer, you have to have faith or you won’t last long.” He went on to explain that you could pick the best seeds for your crops and be diligent about cultivation and weeding. But farmers know that they have no control over the sun or the rain or temperatures that if not just right, could scorch or freeze their crops. What this farmer discovered is that over his long life, God could be trusted. Thankfulness displaced worry. Faith supplanted anxiety. And, even when life is hard or when we suffer, we followers of Jesus have much for which to be thankful. During the Holocaust, when the Nazis put people in concentration camps, they would work the imprisoned until they could no longer do anything. Then, they would execute them. One family was composed of a father, a mother, and their two children, one of whom suffered from a physical disability. Every day, the mother and two children were taken to one work site and the father was shipped to another. And every night, the father checked on his family. One night though, the father found only his one son. "What happened?" he asked. The surviving child said that the brother with the disability had no longer been able to work. And so the guards had taken him to be executed. He clung to his mother's skirt, sobbing. She picked him up and, holding him close to her, said, "Don't be afraid. I'll go with you." And so she did. That's akin to the God we have through Jesus Christ. In Christ, God stands with us in the darkest and the worst of times--even in death--so that all who trust in Him will be ushered into eternity with Him! For that, we can be the most thankful of people. Having heard me say how bad worry is and how important thankfulness is, you all have a right to know whether I worry or not. God indeed gives daily bread to all.., even to the wicked, without our prayer, but we pray in this petition that [God] would lead us to acknowledge our daily bread as His gift and to receive it with thanksgiving. 1. While there are several themes shared by some of the lessons, one underlying theme informs them all: the utter reliability of God for those who trust God completely. Yet all four of the texts, in the face of life's realities, are filled with an affirmation of God's reliability. "I shall not want!" the psalmist declares. "Lord, I believe," the once-blind man says as he worships Jesus. 2. The theme of God's reliability is presented in a different way in the first lesson. Samuel, an Old Testament prophet and judge, had, at God's instigation, anointed Israel's first king, Saul. Saul's reign turned out badly. That's because Saul, as happens with many leaders, began depending on himself rather than on God. (He did this even when he defended his actions with pious explanations.) This made Samuel understandably depressed. While Saul was still in power, some years before he died, God instructed Samuel to go to the town of Bethlehem, specifically to the home of a man named Jesse. Once Samuel was there, God said that He would reveal who Samuel should anoint to become Saul's successor. Seven of Jesse's sons were brought to Samuel. God told him not to anoint any of them, though apparently each looked like a king. Finally, David shows up, the youngest of the lot. "The Lord said, 'Rise and anoint him; for this is the one. '” That's exactly what Samuel did. David, who would go on to be both a great king and a notorious and repentant sinner, is described elsewhere in the Bible as "a man after God's own heart." And this--his dependence, his commitment to following God even when God told him things he didn't want to hear--was the source of David's greatness. David, apparently, didn't look like a king. The runt of Jesse's litter, his father hadn't even asked him to come to the feast that the town was preparing when the famous Samuel arrived in Bethlehem. Somebody had to take care of the sheep; inconsequential David was the choice. But the inconsequential shepherd boy would become the greatest king of Old Testament times, not because of anything intrinsic to him, but because of his utter reliance on God. The blind man given sight by Jesus depended on Him, in spite of the rejection of his fellow Judeans, including even his own parents. This may have seemed like particularly subversive act because Jesus didn't look like a king. But through the eyes of faith, this man saw that Jesus was the King of kings! 3. David, the shepherd boy turned king anointed in our lesson from 1 Samuel, would later write Psalm 23. It begins, "The Lord is my shepherd. I shall not want." In the ancient near East, the term shephed was applied to kings. Here, the psalmist is saying that God is king. This would have been, and remains, a political statement, as is the blind man's impolitic confession of Jesus as the God worthy of his worship. In this political season, when pols promise much and people get swept up in the excitement of supporting this or that candidate, it's good for us to remember that the Lord we meet in Jesus Christ is our only true shepherd, our only worthy king, the only One Who can lead us through the valley of death's shadows into the sunshine of eternity. 4. The motif of light and darkness also runs through three of these lessons. Those who have Christ in their lives are light, according to our lesson from Ephesians. Because of the light of Christ in us, God gives the power to discern what is true and good, sometimes by showing us what is false and wrong, often in us. God guides those who dare to follow trustingly through the valley of the shadow of death. The once blind man was given the ability not only to see physically, but to see Christ as His one and only hope. Just some thoughts. Please pray that our Catechism class goes well on Saturday and that we have a safe and fun experience with the Bible Bowl on Sunday afternoon. 1. Senator Obama, you were opposed to the war in Iraq from the beginning. What basic principles should inform Presidents and Congresses as to when and if the nation should go to war? 2. Senator Clinton, in your most recent debate with Senator Obama, you spoke of having been honored to negotiate with foreign governments on behalf of the United States for a period of seven years. When did you do that? And what agreements resulted? 3. Senator Obama, you have touted your ability to work with those with whom you don't agree. Can you name three pieces of legislation you sponsored and shepherded through the Illinois legislature that required working with members from across the aisle? 4. Senator Clinton, you say that you have been an agent of change who has gotten things done for the American people for thirty-five years. Can you name three substantive pieces of legislation or executive policy which you sponsored and shepherded through the Congress or the executive branch? 5. Senator Clinton and Senator Obama: What sorts of qualities are you looking for in a Vice President? 6. Both senators: Is terrorism is our nation's number one national security challenge? If so, why? If not, why not? 7. Both senators: China is on the rise. Given the size of China, it will probably gain superpower status, both economically and militarily, within the next two decades. Is this a threat to the security of the United States? How should the United States respond, in any case? 8. Senator Clinton: Forty-eight percent of the general electorate indicate that they will never vote for you for president. Why should your fellow Democrats take a chance on nominating you when this would be the highest disapproval rating ever suffered by a non-incumbent nominee for the office? 9. Senator Obama: You have been in the US Senate since January, 2005, three years less than Senator Clinton. Why should your fellow Democrats take a chance on nominating you when you have so little experience? 10. Both: What will you be looking for in a Secretary of State? Secretary of Defense? Attorney General? 11. Both: The line item veto has been advocated by most US presidents since Chester Alan Arthur. That includes Bill Clinton. They, and others, have argued that the President may be the only person who can save Congress from itself by vetoing individual earmarks which members of the House and Senate feel they must secure for the sake of their political futures. Since the Supreme Court has ruled at least one line item veto law unconstitutional, will you support the passage of a constitutional amendment allowing such a veto? Why or why not? 13. Senator Clinton: Was President Clinton wrong to have pushed for the passage of the North American Free Trade Agreement (NAFTA)? Are there any ways in which the agreement should be changed? If so, in what ways? 14. Senator Obama: You are seen as being a major departure from recent Democratic candidates for president. What are the major differences between you and the 2004 Democratic nominee, John Kerry, or the 2000 Democratic nominee, Al Gore? 15. Senator Clinton: Should female voters be automatically predisposed to voting for you? Why or why not? 16. Senator Obama: Should African-American voters be automatically predisposed to voting for you? Why or why not? 17. Both: What should the US do about the genocide in Darfur and other regions of the world? 18. Both: What economic and fiscal assumptions undergird your health care proposals? 19. Both: What fiscal assumptions undergird your proposals regarding education, particularly tuition help for college students? 20. Both: What would you do to arrest the expansion of urban sprawl and the concomitant loss of farm land and monopolization of agriculture? Also: Should the US take steps to ensure that it has an economy composed of workers and companies engaged in all three waves of economic activity: agriculture, industry, information? 21. Both: Which suggested sources of alternative energy are viable? Which are simply hooey? 22. Both: What should we do in Afghanistan? 23. Both: What will you do to restore US relationships with our closest allies? Why twenty-three questions? Why not? In the movie, Return to Me, a young widower, at one point, is set up on a blind date with an obnoxious woman. In her one scene in the film, which takes place in a restaurant, the obnoxious woman insults their waitress, while ordering a particular brand of bottled water. Tap water makes her nauseous, the obnoxious woman claims. She goes on at some length about the superiority of her bottled water over what you get from the tap. The waitress leaves to put in the order and get the woman’s water. But, fed up with the treatment to which she’s been subjected, the waitress pours out the precious special water the obnoxious woman wants and replaces it with tap water. When the woman opens up and tastes her bottled water, she raves about it. Water, of course, is pretty much water wherever it comes from, one of the most common elements in the universe. But it’s also essential for our living. It's so important, that doctors tell us that we should drink about eight glasses of water every day. I bring all of this up, of course, because of our Gospel lesson. There, we find Jesus and His disciples traveling through a Samaritan village called Sychar. You know the Samaritans. They were a population once part of God’s people, the Hebrews, Israel. But after the reign of Solomon, the nation split in two. A northern nation, called Israel, with its worship life focused in a city called Samaria, went one way. The southern nation, with a greater claim to faithfulness to God, called Judea, went another. Its worship life centered on Jerusalem. Jesus was a Judean. Judeans looked down their noses on Samaritans. They regarded them as idolaters, people who worshiped other gods. And, in fact, as Jesus intimates in the lesson today, the Samaritans did try to hedge their bets when it came to their religion. They claimed to worship the God of the Bible. But at the same time, up on Mount Gerizim, not far from Sychar, the Samaritans worshiped the puny false deities of at least five other cultures. When Jesus’ party gets close to Sychar in today’s Gospel lesson, the disciples enter the village to buy some food. They leave Jesus sitting by a well. That’s when a Samaritan woman arrives to draw water. Of course, Jesus isn't talking about ordinary water. This water yields more than passing refreshment or even vital fluids for the functioning of physical bodies. This water is the very presence of God in our lives. It’s forgiveness for the repentant sinner. It’s new life that never gives out for all eternity. A woman facing death once asked me, “What can I do?” It struck me as odd that a person flat on her back in a hospital bed, unable to move, and near death thought that there was something she could do to get into heaven. I told her that it was simple. She needed to turn her life, even her sin, over to God and believe in Jesus. 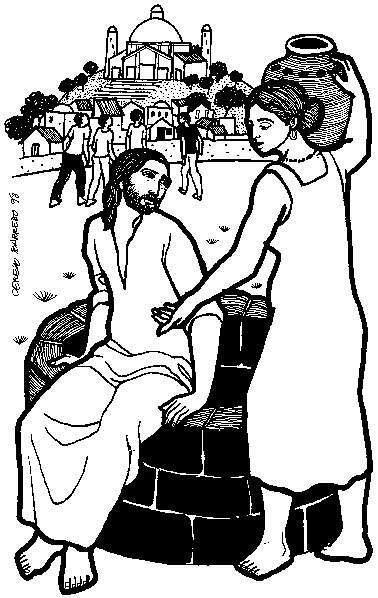 She needed to do the hardest thing in the world for us to do: She needed to do nothing, to simply let Christ take her in His arms, forgive her, and guide her. Jesus is the source of living water, of life that lasts forever. All we have to do is ask for it and receive it. And this water doesn’t just help us in the sweet by-and-by. It can bring us life today! In one of his books, the late missionary, evangelist, and author E. Stanley Jones, a friend and confidante of Mahatma Gandhi, talks about a woman of his acquaintance. Wasn’t God amazing? I don’t know why any Christian should discard miracles. I believe in miracles. [Jesus] healed me. What could be more miraculous than the forgiveness of sins? Or the taking away of all bitterness, all resentment? And the peace and joy that follow are indescribable. The laughter that comes bubbling up at most unexpected times, in me who thought a few years ago that I would never laugh again...it rises from a well of living water that will never cease. I am grateful beyond words. Jesus doesn’t promise, of course, that when we follow Him, all our troubles will go away. But He promises to be with us, to help us forge through life with hope and joy and, above all, the very life of God filling them with a vitality that belies our years, our scars, our regrets, and our biographies. Shortly after her conversation with Jesus, the Samaritan woman to whom Jesus had promised living water ran into town. Literally, she says to the other villagers from Sychar, “He cannot be the Messiah, can he?” That’s hardly a ringing endorsement of Jesus’ lordship. It's sort of like saying, "Meet my new husband. He can't possibly be a good guy, can he?" But what the woman said was the most her faint, embryonic faith could muster at the time. What’s more, it was enough, more than enough, to turn an entire village to Jesus Christ! What’s really interesting to me, though, is that it wasn’t the promise of living water that turned this woman into one of the unlikeliest evangelists ever! It was something else about her encounter with Jesus. An old saying tells us, “A friend is someone who knows all about us and loves us anyway.” Through Jesus, the Samaritan woman came to experience that God gives the ultimate expression to that kind of friendship. Jesus knew all her. But He didn’t preach at her. He didn’t scold her. He didn’t even tell her to repent. He just displayed a knowledge of her life story and reached out to her anyway. That was what turned her into a witness for Jesus. On the day after Easter, you know, I’ll begin offering a five-session class called Witnesses for Christ. It’s designed to help all of us who believe in Jesus to be more confident in inviting others to get to know Jesus. I hope that lots of folks will be part of the class. But, you know what? The Samaritan woman in our Gospel lesson never took Witnesses for Christ. In fact, some might say that she didn’t even do a very good job of witnessing. Instead, she met Jesus sort of like you and I are this morning and then, amazed that God loved her and wanted her just as she was, invited others to get to know Him, too. Jesus Christ knows all about you and me and He loves us just as we are. He knows our regrets. But He wants us forever. He wants us right now. He wants to erase our sins. He wants to fill us with living water that erupts into new life for us today and always. That’s good news for us. And it’s good news just as worth telling in Logan, Ohio on February 24, 2008 as it was in the ancient village of Sychar in Samaria two thousand years ago. Who knows what might happen if you and I tell others about the giver of living water who knows all about us and loves us any way. All of Logan might suddenly bubble with the living water of new life from Jesus Christ. I don’t know about you, but I would love to see that happen!